Fr. 2231-A. 1934 $10,000 Federal Reserve Note. Boston. PMG Choice Uncirculated 64.These $10,000 Federal Reserve Notes are one of the most coveted pieces of collectible United States currency as the incredibly high face value was an astonishing amount of money during these notes circulation period. 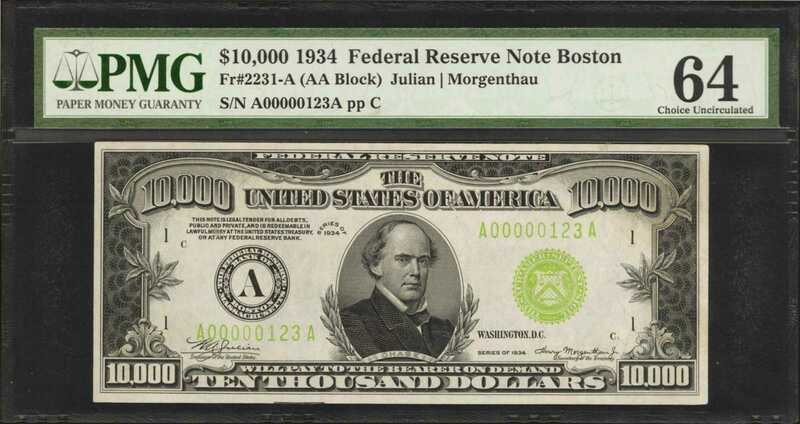 According to our research there is an estimated (10) 1928 $10,000 & (200) 1934 $10,000 Federal Reserve Notes known in all grades and districts combined.pA prominent face design depicts a portrait vignette of Salmon Chase, the Secretary of the Treasury during the Civil War. Arched "10,000," counters, upper left and right with "THE UNITED STATES OF AMERICA," between. Laurel leaves seen at left and right frame and also flanking the portrait. A simple year powerful back styling shows with four "10,000," counters at the corners and large stylized "10,000," center with "THE UNITED STATES OF AMERICA, TEN THOUSAND DOLLARS." The quality of this ultra-high denomination note is quite striking at all technical facets. Vividly overprinted serial numbers and treasury seal further the appeal. In our opinion this note is superior to the PMG 64EPQ Holecek Family Foundation example we sold in 2015 for $223,500. It is just four serial numbers away but is seen with far superior centering, and overall eye appeal. PMG Pop 1/2 finer.